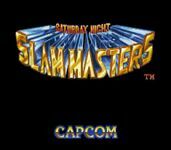 "Saturday Night Slam Masters, known in Japan as Muscle Bomber - The Body Explosion , is a 1993 pro wrestling arcade game released for the CP System by Capcom. The game features character designs by manga artist Tetsuo Hara, famous for Fist of the North Star. The game was followed by an updated version titled Muscle Bomber Duo in 1993, and a sequel called Ring of Destruction: Slam Masters II in 1994." Source: Wikipedia, "Saturday_Night_Slam_Masters," available under the CC-BY-SA License.